Cost: $3,995* (USD) + $75 application fee by March 1. 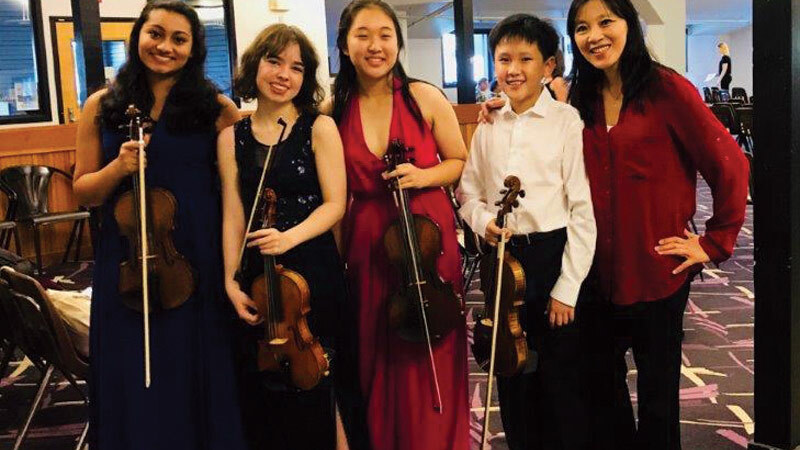 Tuition includes room and board, lessons, coachings, masterclasses, performances on and off campus, full access to all festival faculty concerts, lectures, events and KMF’s music library. 24-hour supervision is provided for students ages 12-17. *Piano students will be charged an additional cartage and tuning fee of $250. • $75 application fee. Must be sent with application (non-refundable). In addition to the tuition, each student must pay a lodging security deposit to the Inn upon arrival. The deposit will be returned in full at the end of the Festival if there are no damage assessments and no outstanding balances. Students requesting additional private lessons may make arrangements with the Festival by contacting the office at 802.773.4003. REFUNDS. There will be no refunds of any kind after May 1, 2019, except for a documented medical emergency, in which case room and board only will be refunded on a pro-rated basis. The Killington Music Festival reserves the right to expel any student for violations of KMF’s policy, city ordinances or state law without refunding any fees paid. Scholarship assistance is available, but it is limited. Please investigate your local community (religious groups, schools, arts, civic organizations such as Rotary, Kiwanis, Lions, etc & private donors) for alternate sources of financial aid. For a Financial Aid Application please click here. All Financial Aid applications must be submitted by March 1, 2019 for consideration and must be accompanied by an application and the application fee.